This sophisticated bouquet holds a symphony of colors. 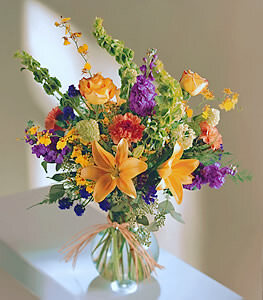 Orange lilies are surrounded by yellow roses, bells of Ireland, yellow oncidium orchids, purple stock and more. A great gift for any occasion. This item may not be available for same day delivery in all areas.